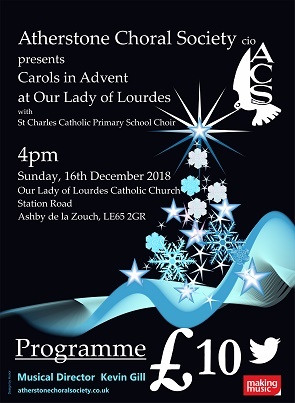 The lovely church of Our Lady of Lourdes celebrates its Centenary this year (2018) and, as a final celebration, we are delighted to offer this afternoon of Advent and Christmas Choral music led by Atherstone Choral Society with readings and poems and carols and to include the children’s choir from St Charles School in Measham. Music in this beautiful church is always popular in the town and is particularly lovely at Christmas, so please put this date in your dairy now to ensure a place. Programmes are available from 25th November from Liz Powell at the church, or by phoning 01530 589334,or from St Charles Catholic Primary School Measham, and on the afternoon of the 16th December on the door.